We’ve all met that sales guy. The one who thinks he’s starring in his own version of Glengarry Glen Ross and that his goal is simply to close the deal with a yes, whether it’s in his customer’s best interests or not. He wants to move on to the next sales opportunity as quickly as possible. And 20 years ago, this guy would have been a deal-closing rock star. But today he’s a liability. Selling something that doesn’t fit a customer’s needs or desires is a quick route to bad word of mouth. In the past, it took a while for bad word of mouth to catch up to a company. But now companies can be ruined by bad online reviews in the blink of a tweet. Getting to yes is still important. But more important is getting a yes that makes sense for the customer. That qualified, long-term yes requires a different, slower approach. In my work, I often deal with companies and people in distress where pushing too hard is not only ineffective, but potentially damaging. Instead of selling and focusing on the yes, I build trust, give information, ask questions, and listen to the answers. This method is slower, but ultimately a more effective way to get what you want, whether that’s a sale or conflict resolution. I often advise call center agents and sales people to not even try to collect money or get an order with a first call. The first call is about engagement. One of the easiest ways to build engagement is a simple question, “Is this a good time to talk?” When people answer a call from a collection agent or a sales person, they don’t expect their own needs to be considered. If the answer is no, simply ask when a better time to talk might be, and then honor that request. If the customer wants to talk in the evening or the next day, follow through, or have a colleague do so. By asking for information about the customer's needs and following up, you’ve started to establish trust. If they answer yes and want to talk now, you’ve already gotten your first yes of the call, and you know the customer is engaged and ready to listen. Once you have engagement, you can build trust to find out why an order hasn’t been placed, or why a bill hasn’t been paid. If you attempt to move too soon, you’ll get empty promises to read information or put a check in the mail. Of course, many call center agents don’t have the luxury of making more than one phone call. Don’t worry, you can still make a sale in one call. First and foremost, you need to keep the idea of building engagement and trust in mind. One of the quickest ways to lose a customer’s interest is by not having all of the necessary or correct information to handle questions. In the early stages of a call, if you need to ask the customer to hold while you look something up or check with a supervisor, you are likely to lose the sale. As long as the customer is talking, he or she is giving you information that you can use to help you make the sale. The more you can find out about your customer and your product before making a phone call, the more successful you’ll be. 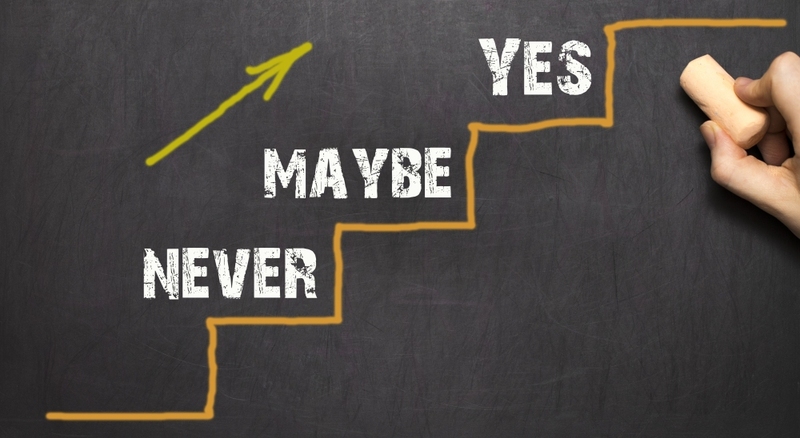 A few years ago I heard a successful salesman discuss a way of building up to a big yes through a series of smaller yeses. Imagine selling a vacation package. As the sales person you would ask and then re-ask questions when you know the answer is yes. People don’t want to seem contradictory or illogical, so if you confirm that they agree vacations are important, but that trying to find a hotel room is a pain, and that it would be nice to have one place they knew they could go to at their budget, then it’s hard for them to then say “Yes, that’s exactly what I want, at the price I want, but I’m not interested.” By getting the customer to say yes throughout the conversation, you are more likely to have a yes at the end. Ultimately, getting to yes means discovering what the customer wants, building trust and engagement, and showing them how you can help. That’s also the quickest route to positive word of mouth and long-term customer loyalty. Dean Kaplan is president of commercial collection agency The Kaplan Group.